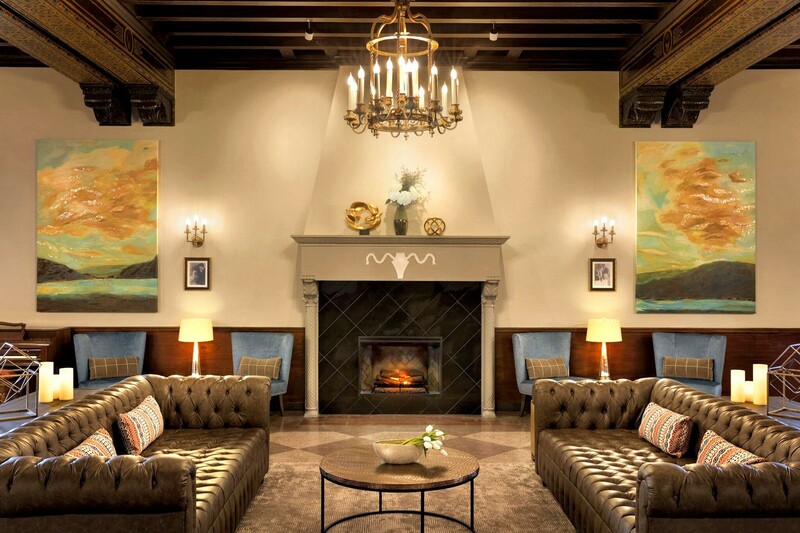 The Great Hall of the Hotel Saranac was influenced by the 14th century Palazzo Davanzati in Florence, Italy, with ornately painted grand beams that depict geese, hare and fish. Fall in the Adirondack Mountains is a time of generalized confliction. Coming in search of outdoor tranquility, you might find yourself vying for a piece of the six million-acre park that more than 10 million visitors have come to enjoy (roughly 137,000 people live here year-round). Here, cabins, lakeside villas and cottages are the accommodation staples. But what about a modern indulgence? Sparse but cozy. Umber fabrics shaded the window of my room, a single king (170 square feet, $179). Below the window sat a blue velvet couch. Dark wood furniture bookended the bed, accented by the hotel’s original wooden doors and brass doorknobs. Nine room categories range from a single queen (170 square feet) to a suite with one king-size bed and a living room (469 square feet). Outside my window, enhancing the haunted tales of hotel ghosts shared with me by the concierge, were webs of live spiders. In my room, a single retro travel poster depicted a silhouette shouldering a canoe beneath the words "Saranac Lake." Article originally from The New York Times.